A Cappella has fast become a regular feature at the Edinburgh Fringe Festival and groups are getting top notch reviews from music and non-music fans alike. 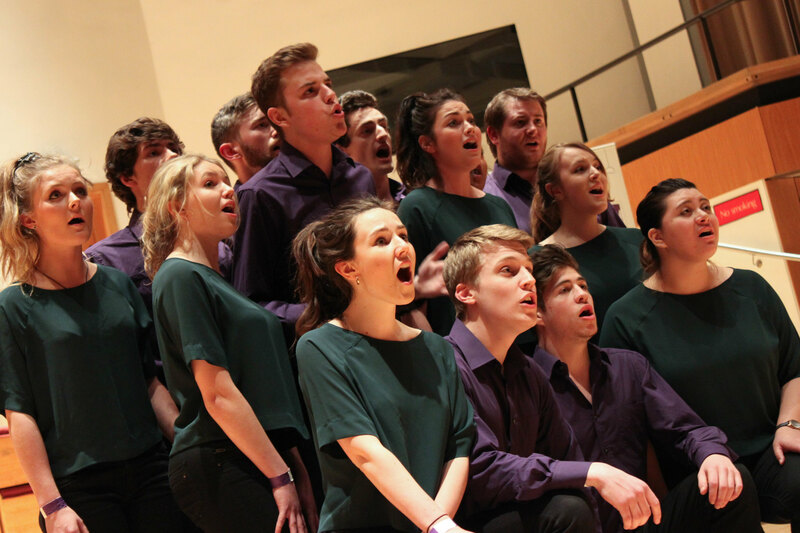 We’ve trawled the programme for all the a cappella that we could find and listed it in one place for you with a few top tips too! Of course if you’re only able to make one show, come and see The Voice Festival’s very own showcase on 9 August at Greyfriars Kirk. This way you’ll be able to see 10 smashing a cappella groups doing their thing! There’s also a workshop during the day so if you fancy having a try at a cappella then come and join the fun. If you’re looking for a last minute booking, we reckon there are the most options in the first week. But, if you’re heading to Edinburgh later in the Festival there are still some absolutely phenomenal acts that you’ll be able to enjoy – and as groups reach the end of their run they tend to have really finessed their performance. Edinburgh is a great opportunity to see something different, so go and try a new group and get inspired for your next a cappella adventure! What do we know about them? Always smooth, always polished and with some unusual a cappella arrangements. What do we know about them? Tight and polished a cappella with slick (and cheesy) choreography. What do we know about them? Oxford’s oldest a cappella group who have won numerous Voice Festival awards. What do we know about them? Lush harmonies, strong male voices and we know there are future stars in this group. What do we know about them? Barbershop, barbershop, barbershop! Expect sparkling jewellery, sparkling smiles and songs & harmonies you’ll know and love. What do we know about them? Some of the videos we’ve seen suggest they’ll have an exciting show. What do we know about them? Standing up, lying down, this group can sing and dance! (If you don’t know what we’re talking about catch this video from 8:10 onwards). What do we know about them? This year’s champs really put on a show. I reckon the name suggests there’ll be more where this came from. What? Get Jazzy On It! What do we know about them? A new all-female group from Exeter (which we know is a haven for a cappella groups to develop) who are in Edinburgh for the first time. What do we know about them? They’ve been to the USA this year so they’ll be at the top of their game. We’re expecting songs at breakneck speed but most looking forward to slower numbers like Hide and Seek or Hallelujah. What do we know about them? Something a bit off the wall… audience members sit blindfolded and are hugged by the performers, apparently so as to experience the performance through sound, breath and the vibrations of singers’ body. If not at the Fringe then where, eh? What do we know about them? We don’t know that much but a show that promises to make us feel the spirit of Ghana is bound to bring a smile to the face of anyone on a rainy Edinburgh day. What do we know about them? Bang up to the minute songs and moves to match. What do we know about them? This all-female group have really developed over the last 18 months and they aren’t afraid to try daring arrangements. Expect some first class beatboxing too! What do we know about them? A group that made it to the University Semi-Finals in the first year of their existence has got to be worth a list. Oh and they sang Anaconda. What do we know about them? We know Jack Blume is involved (of Liquid 5th and formerly of Sons of Pitches) and he’s just brilliant at creating new, exciting and innovative a cappella. What do we know about them? This group always delivers at Edinburgh and all their experience means their show never disappoints. What do we know about them? A group that has got better each year we’ve seen them are taking their first trip to the Fringe. Memorably their beatboxer won the Voice Festival’s inaugural beatboxing battle, and did a pirouette in the process. What do we know about them? TUBBS bring boundless energy to their performance. You will definitely come out smiling! What do we know about them? It’s the only place all festival you’ll get to see this much variety in a cappella in 90 minutes. What do we know about them? So natural. So free. Look like they are BORN to perform. What do we know about them? These ladies are tremendous fun (and unquestionably have the best trousers of any a cappella group) and their shows always have a strong theme or narrative. What do we know about them? Not all that much, but the group have got rich musical backgrounds and promise close harmonies in songs from 50s to the present day. What do we know about them? The Sons are going from strength to strength. Headlining the Youth Final this year they improvised a song that included the line “Pizza. Not traditionally a Russian delicacy”. Seeing is believing. What do we know about them? Again, very little! But we’re pretty sure that the show that brought us the Pentatonix has got it right!